Christmas Pudding for sale. Buy online at Zingerman's Mail Order. Gourmet Gifts. Food Gifts. From the culture that brought you fruit cake comes another holiday food tradition: Christmas pudding. 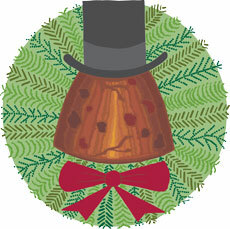 The roots of this Christmas pudding go back to Victorian England. The holiday pudding would be made from brandy soaked dried fruits, sugar, eggs, lots of spice and just enough flour to hold it all together. Traditionally it was aged during the month leading up to Christmas, then steamed and eaten for dessert at the holiday feast. This particular pudding comes to us from Thursday Cottage in Essex. They craft it with dried currants and red and white raisins that are soaked in Cognac to intensify their flavor and give them a juicier texture. They use their own orange marmalade in this recipe as well as sugar, flour, citrus peels, cinnamon, cloves, ginger and another touch of Cognac before steaming it for half a day or more. After that, the pudding is aged for weeks to allow the flavors to meld and mature. It's traditional to steam the pudding for a couple of hours before serving, but Victorians didn't have microwaves and they work too. Serve for dessert in thin slices drizzled with hot homemade brandy butter.